Streaming services of all types are becoming some of the most popular and influential platforms in the world. Streaming has quickly developed a strong presence in a variety of different media markets such as music, television, film and even podcasting. These days, anyone with a smartphone has access to seemingly endless hours of free and paid streaming content. Given that around 85 percent of all Americans ages 18 and up own a smartphone as of 2018, it’s easy to see why this method of entertainment has become so incredibly successful in recent years. Not only is the market becoming widespread, its also becoming highly profitable. Music streaming revenues in the United States reached over 5.5 billion U.S. dollars in 2017, while subscription video-on-demand services brought in an estimated 12.5 billion. In regards to the music industry as a whole, subscription based services and streaming play an especially vital role as they accounted for well over half of the total digital music revenue in 2017. Some of the largest players in this industry are Pandora and Spotify, both of which average active sessions in the multi millions. Another branch of this industry which is also gaining popularity is podcasting. During a recent survey, 30 percent of respondents stated that they listen to podcasts daily or several times a week, both at home and on-the-go. Along with Spotify, Apple Podcasts and Google Play Music are the biggest names in podcasting distribution. 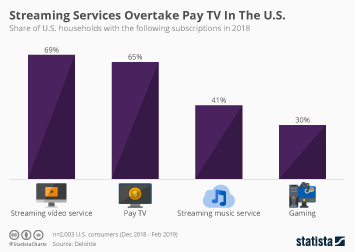 Over 45 percent of U.S. households have access to some sort of streaming video on demand service, with over 25 percent of U.S.-based consumers subscribing to Netflix alone. Around 22 percent of adults use paid online video streaming services several times per day, with a large portion of these users spending between 30 minutes and 3 hours every day. The undisputed frontrunner in video subscription services is Netflix, which had nearly 53 million subscribers in the United States in 2017, more than double that of its closest competitor, Amazon Video. One of the strengths of this type of service is the variety of platforms with which the service can be accessed; aside from the websites themselves, users can access content from video game consoles, smartphone and tablet apps, smart TVs, and others.